This Companion presents both an introduction to the history of the ancient philosophical school of Epicureanism and also a critical account of the major areas of its philosophical interest. Chapters span the school's history from the early Hellenistic Garden to the Roman Empire and its later reception in the Early Modern period, introducing the reader to the Epicureans' contributions in physics, metaphysics, epistemology, psychology, ethics and politics. The international team of contributors includes scholars who have produced innovative and original research in various areas of Epicurean thought and they have produced essays which are accessible and of interest to philosophers, classicists, and anyone concerned with the diversity and preoccupations of Epicurean philosophy and the state of academic research in this field. The volume emphasises the interrelation of the different areas of the Epicureans' philosophical interests while also drawing attention to points of interpretative difficulty and controversy. Introduction James Warren; 1. The Athenian garden Diskin Clay; 2. 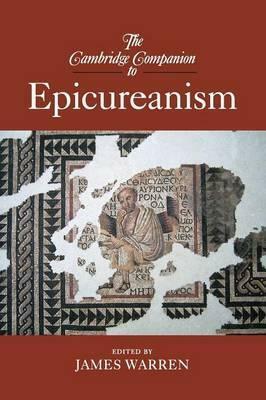 Epicureanism in the Roman Republic David Sedley; 3. Epicureanism in the Roman Empire Michael Erler; 4. Epicurean atomism Pierre-Marie Morel; 5. Epicurean empiricism Elizabeth Asmis; 6. Cosmology and meteorology Liba Taub; 7. Psychology Christopher Gill; 8. Action and responsibility Tim O'Keefe; 9. Pleasure and desire Raphael Woolf; 10. Politics and society Eric Brown; 11. Philosophy of language Catherine Atherton; 12. Poetry and rhetoric David Blank; 13. Removing fear: the gods and death James Warren; 14. Epicurean therapy: pedagogy and improvement Voula Tsouna; 15. Epicureanism in the early modern period Catherine Wilson; Bibliography; General index; Index of passages from ancient text. James Warren is a Senior Lecturer in the Faculty of Classics, University of Cambridge. Previous books include Facing Death: Epicurus and his Critics (2004) and Epicurus and Democritean Ethics: an Archaeology of Ataraxia (2002).